To those who took part in the social revolution of nearly half a century ago, the 21st century was expected to be a time of Utopian ideals. Instead, the world has entered a Dark Age of growing extremism, in which hate-mongering and race-baiting have replaced efforts to promote positive change. Instead of leaving the world a better place than they found it, the aging architects of that revolution have had to watch their accomplishments undermined and eroded. This has led to an atmosphere of despair. Many wonder how we can come back from a culture war in which every day brings escalated rhetoric and the threat of increasing violence. The answer, of course, is the same as it has always been. The only way to win a war of ideas is to win the hearts and minds of the people. And the only way to truly win hearts and minds is to be right. 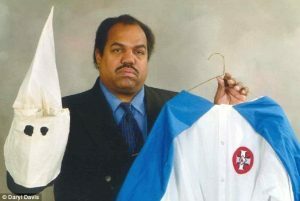 For several decades now, a man named Daryl Davis has been doing just that, in a manner that is as unlikely as it is courageous. Davis, who holds a bachelor’s degree in music and who has performed with artists such as Chuck Berry and Jerry Lee Lewis (to say nothing of his own band), is a Black man who was a child during the Civil Rights Era. He experienced firsthand the harsh reality of that struggle when he became the first Black member of a local Cub Scout troop in Massachusetts. But his innate intellectual curiosity combined with his benevolent disposition to form a most unique reaction to the problem of racism. 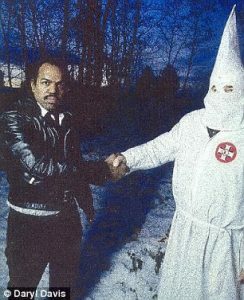 It was in 1983 that Davis met a member of the Ku Klux Klan for the first time, in a bar in Maryland where Davis was performing. This proved to be an educational experience for both men. For the Klansman, because he had never known a Black man before and so was suddenly seeing one as a human being. And for Davis because he finally found the answer to the question of how someone could hate him without knowing him — it was because they didn’t know him. 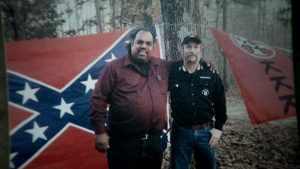 The friendship that resulted from this encounter not only turned this Klansman away from the Klan, but showed Daryl Davis his path forward. Over the course of the years that followed, demonstrating patience and tolerance that can only be described as superhuman, Davis met many more Klansmen, by arranging introductions, setting up interviews, and even getting himself invited to Klan meetings. He believed that most racists hold their beliefs because of misconceptions instilled in them in their childhoods, and that it is difficult to maintain these prejudices when confronted with an actual person who belies them. In short, he believed that the cure for ignorance is education, that the cure for suspicion is kindness, and that the cure for hatred is friendship. In this, he has been proven correct many times over. Davis is currently in possession of more than two dozen KKK robes, given to him by former Klansman who have abandoned their ideology, disarmed by the mere existence of this good-natured peacemaker. Among those who have foresworn White supremacy in favor of a Black friend is Roger Kelly, former Imperial Wizard of the Maryland KKK. Kelly later invited Davis to be his daughter’s godfather. Unbelievably, or perhaps not given the current political climate, Davis has been on the receiving end of criticism from some who self-identify as Progressives, including some members of Black Lives Matter and the NAACP. He has been called an Uncle Tom, and worse, and his achievements have been minimized and trivialized. After all, say his detractors, what difference does it make that in thirty years one man has softened only a smattering of hearts, has changed only a handful of minds? But what if everyone was like Daryl Davis? Hutchins is a regular contributor to this blog. Two of his published essays, on astronaut and scientist Mae Jemison and the Fantastic Four’s Reed Richards, can be found in our book Heroic Leadership. I had always been hesitant to have a personal hero, for placing any person on that pedestal seemed to imply lofty, even unattainable expectations to be met. However, after having read compiled literature on heroes, I realized I had been operating with a skewed definition of heroism, one that included the expectation (either overt or covert) of perfection from a hero. I suppose if that were true, we wouldn’t need to distinguish heroes from God. In identifying one of my heroes, I considered the argument that “all of humanity – not just a select group of moral elite – is capable of heroism” (Allison, Goethals, & Kramer, 2017). True heroism calls for both morality and influence, but morality can be subjective. We, as individuals, prioritize different values over others based on our own experiences. As such, we have different ideas about who meets “heroic” standards. I personally have a passion for social justice, as well as an interest and appreciation for people of all walks of life. 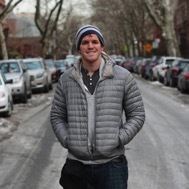 With those values and interests in mind, Brandon Stanton, the creator of the “Humans of New York” blog, is one of my heroes. 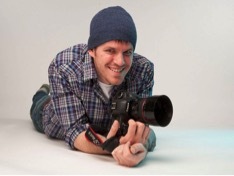 Brandon Stanton started the “Humans of New York” blog in the summer of 2010 with the intention of compiling an “exhaustive catalogue” of people in New York City by taking photos of 10,000 New Yorkers. His project quickly evolved, and he began recording tidbits from the New Yorkers he photographed. These quotes and short stories give a glimpse into the lives of the people he photographs, and provides the blog’s followers with inspiration, compassion, and often a good laugh. Today, the blog maintains 17.18 million followers from all around the world. His work is fascinating in part because it challenges viewers to acknowledge that no matter how we perceive people at first sight, we can never know their unique experiences and how we may be able to relate to them. His daily posts on my newsfeed serve as a constant reminder for me to resist the urge to hastily judge others. It is also important to note that the blog does not engage in partisan rhetoric, a practice that I feel often further polarizes us. In 2016, the Internet and social media are some of the most powerful vehicles for social movements and influence. The vignettes of human experience Stanton carefully crafts reflect that he is “not only…powerful and charismatic,” but “held in fascination by a strong faith,” which in turn “awaken[s]” a similar faith in his 17.18 million followers (Allison, et al 2017). As such, Stanton seems to have recognized the power and responsibility of his role in promoting social change. While I have followed and enjoyed his blog for a few years now, it is Stanton’s most recent posts that make him a hero for me. With the recent tensions in the Middle East bringing an influx of Syrian refugees to the US, many Americans are giving in to fear of the unknown and resisting our nation’s efforts to provide aid to the refugees. Brandon Stanton traveled to the Middle East and began photographing and interviewing displaced Syrians, Muslims, and other Middle Easterners, illuminating the humanity of their experiences. In other words, Stanton showed us all that these refugees are not a mob to be feared or shunned, but individual human beings in need of our acceptance and help. After awakening compassion and concern in his followership, Stanton took the next step and organized enormously successful fundraising efforts for many of the families he met overseas. Brandon Stanton’s understanding of and appreciation for people continues to give us a daily dose of laughs, empathy, and exposure to new ideas. It is his willingness and dedication to using his influence to inspire social change, however, that makes him a hero. Allison, S. T., & Goethals, G. R. (2017). The hero’s transformation. In S. T. Allison, G. R. Goethals, & R. M. Kramer (Eds. ), Handbook of heroism and heroic leadership. New York: Routledge. Allison, S. T., Goethals, G. R., & Kramer, R. M. (2017). Setting the scene: The rise and coalescence of heroism science. In S. T. Allison, G. R. Goethals, & R. M. Kramer (Eds. ), Handbook of heroism and heroic leadership. New York: Routledge. As a senior in high school, I found myself desperately looking for any opportunity that would enable me to go on free trips to escape the county in which I live, Arlington County, Virginia. At my school, all seniors must complete a massive yearlong project intended to make them branch out, get involved in the community, and pursue something they are passionate about. I decided to do my project on photography. My central objective as a photographer was to explore cities and find the beauty in chaos that exists within them. One day, I was walking through the halls of my newly renovated high school when I saw a flier to go on a trip to New York where we would attend a conference at the United Nations Headquarters. My naïve self only had eyes for the awesome opportunity of doing a photo-walk around Times Square. Little did I know I would be leaving that city with a new perspective on society. There was one particular speaker named, Deepa Willingham, who delivered a quote that will forever stay with me. It went along the lines of, “You can teach a man to fish, you feed a man for a lifetime. But if you teach a girl, you teach a community”. The moral of this quote is that educated men typically leave home to pursue a career, while women stay at home. If an educated woman were to stay home, it could be the start of endless possibilities. She could teach her kids as well as the other community members. Inspired by this idea, I decided to do more research on inspirational women such as Deepa Willingham. That is when I stumbled upon Malala Yousafzai. 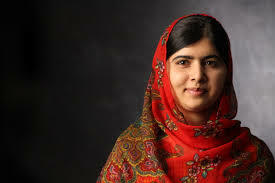 Malala Yousafzai is the youngest person to ever receive a Nobel Prize. She was born on July 12, 1997. Yousafzai is known for advocating human rights and education in general but especially for women’s rights to education. She lived in Swat Valley, located in the Khyber Pakhtunkhwa province of northwest Pakistan. This area was an extremely dangerous and problematic part of Pakistan, as the local Taliban would go to any lengths to prohibit girls from attending school. Rising up from Taliban oppression, Yousafzai wanted to let the world know of this injustice. She wrote a blog revealing what life is like under Taliban occupation, their threats to control the country, and her views on education for the girls in Swat Valley. As you would expect, Yousafzai’s popularity grew, even leading to interviews and a documentary film about her life. The Taliban took notice. 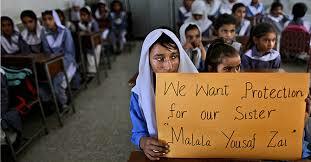 On October 9, 2012, a gunman shot Yousafzai three times as she was boarding her school bus. She was in critical condition but luckily she survived. Despite Pakistan’s effort to protect Yousafzai and her family, the Taliban persisted in making assassination threats. In a way, these murderous threats helped give visibility to the issues that Yousafzai promoted. One positive consequence of Yousafzai’s long, painful activism was a United Nations’ petition demanding all children to be in school by the end of 2015. As a result, Pakistan ratified their first Right to Education Bill. Yousafzai knew there was great danger in speaking out for her beliefs, but this did not deter her. Today, she delivers speeches worldwide, writes blogs, and oversees the Malala Education Foundation, which enables girls living in poverty to attend school. 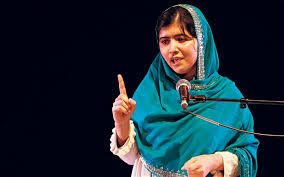 Malala Yousafzai is very young, yet it seems that she has already lived through a lifetime of hero’s journeys. Let it be known that this is only the start of her work to improve people’s lives. Malala Yousafzai still has a bright future, one that will be devoted to standing up for people’s rights. She has proven that she is willing to pay any price and make any sacrifice to make the world better. In my life I can only hope to obtain a fraction of Malala’s greatness. Pedro Albizu Campos was the consummate hero. In 1921 he became the first Puerto Rican to graduate from Harvard Law School while mastering many different languages — English, Spanish, French, German, Portuguese, Italian, Latin, and Greek. After earning his Harvard law degree, he returned to Puerto Rico and opened a one-man law office where he accepted food, water, and clothing as payment for his legal services from people who could not afford a lawyer. 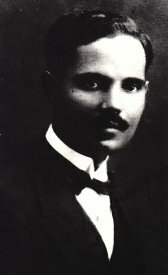 Pedro Albizu Campos was a man who was more concerned with the progress of the Puerto Rican people than with his own personal gain. As president of the Puerto Rican Nationalist Party (PNP), he was determined to lead Puerto Rico in its political battle against the United States for the island’s independence. It was during his time as president of the PNP that Puerto Rico would rally the most support it had ever seen towards its fight for political autonomy. As befitting a hero, Albizu Campos was able to overcome considerable adversity. During his time in the United States, like many other people of color, he had to overcome blatant racism. After World War I broke out, Campos volunteered for the U.S. military and was commissioned Second Lieutenant in the army reserves. Upon completing his training Campos was assigned to the 375th Regiment, the unit reserved strictly for blacks—an act that was in accordance with the US military policies of the time due to racial segregation. Pedro Albizu Campos would eventually be honorably discharged in 1919 with the rank of First Lieutenant. Campos graduated from Harvard Law School with the highest grade-point average in his entire law class, earning him the right to give the valedictorian speech at his graduation ceremony. Many people at Harvard did not appreciate having a mulatto Puerto Rican as valedictorian, so one of his professors delayed two of his final exams, thus keeping Campos from graduating on time. He would eventually receive his degree a year later after taking both exams and passing them while in Puerto Rico. 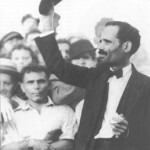 The conflicts that Pedro Albizu Campos experienced with the U.S. were his motivation for leading the PNP in its fight for Puerto Rico’s independence. During his time as president, members of the PNP met U.S. repression with armed resistance. 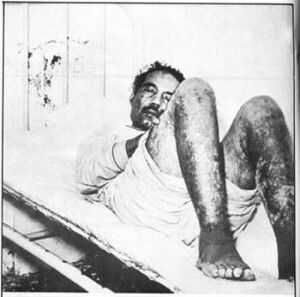 In 1950 Campos was arrested as a political prisoner and was subjected to human radiation experiments leading to his death in 1965. Ironically enough this abuse occurred decades after Campos accused Dr. Cornelius Rhoads (a leading cancer specialists with the Rockefeller Institute) of injecting live cancer cells into Puerto Ricans to see if the cancer could spread. The accusations came from a manuscript Rhoads had written which Campos had published after getting his hands on it. It was not until 1994 that the U.S. Department of Energy admitted to conducting these human radiation experiments on Campos and other individuals. Campos thus became the focal point of tension between the U.S. and Puerto Rico, putting his life on the line in the process. The lasting legacy of Pedro Albizu Campos and his fight for his people’s freedom has been compared to that of Patrick Henry, Nat Turner, Chief Crazy Horse, Frederick Douglass, and Nelson Mandela. Albizu’s political and military actions forever transformed Puerto Rico, its people, and its culture. In the early 20th Century, men and women were considered quite different animals and the social roles assigned to them reflected that belief. Women were expected to keep house and raise children while the adventures of invention and exploration were left to the men. Going beyond those expectations was not encouraged, and often punished. Most people conformed to those limitations, but some were not content to be grounded–- some, like Harriet Quimby, felt compelled to find new horizons. A year later, in 1911 (more than a decade before Amelia Earhart), Quimby became the first woman in the United States to earn an aviator’s certificate. Her friend Matilde Moisant became the second shortly thereafter. But Quimby was not yet finished with making history. The next year, in April of 1912 (the day after the sinking of the Titanic), she became the first woman to pilot an aircraft across the English Channel. Sadly, her next milestone was a tragic one. In July of 1912, she attended, and participated in, The Third Annual Boston Aviation Meet at Squantum on Dorchester Bay. While circling Boston Harbor, with event organizer William Willard as a passenger, her plane experienced unexpected turbulence and both pilot and passenger fell to their deaths, the plane crashing on the beach. A century has now passed since the untimely death of Harriet Quimby. The romantic figure of the first aviatrix in her distinctive purple flight suit is all but forgotten. But thanks to her and others like her, the opportunities for women in society have expanded to a degree that few in her lifetime would have believed possible. Yet it is still true, well into the 21st Century, that both women and men are pressed to limit themselves to roles defined by their gender. Most will conform. But some will not be content to be grounded. 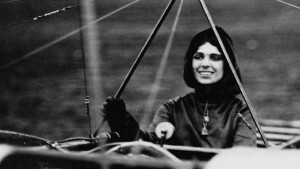 And thanks to those like Harriet Quimby, their flight may be a little smoother. This is Hutchins’ fifth guest blog post here. His first two, on astronaut and scientist Mae Jemison and the Fantastic Four’s Reed Richards, appears in our new book Heroic Leadership: An Influence Taxonomy of 100 Exceptional Individuals. 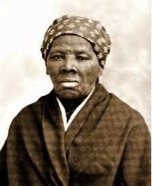 In 1820, Harriet Tubman, born Araminta Ross, was born into a family of slaves in Maryland. Several of her siblings were sold by their owners and she never saw them again. 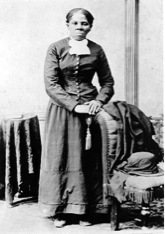 Harriet spent countless hours laboring for others. Along with doing manual work for her owners, she had to put up with numerous beatings, one in particular that split her skull open and never healed, causing severe brain damage. She never received any medical attention and the trauma resulted in epileptic seizures and narcolepsy for the rest of her life. Her resentment and anger at her circumstances steadily grew, particularly after she was threatened with being sold, fueling her passion to escape and bring others along with her. Harriet was called to be a freedom hero. In 1849, Harriet became ill once again as a result of her head injury. Her value as a slave was diminishing and her owners were attempting to sell her. Soon afterward, one of her owners died and it became likely that her family would be split up and sold to different owners to settle his estate. Harriet decided she would not be sold again so she fled to Pennsylvania through the Underground Railroad. She successfully avoided slave catchers by traveling at night and seeking the protection of abolitionists. She had not been in free territory for long when she heard that her niece was going to be sold. Tubman decided to go back to slave territory to save her niece and her children. She selflessly wanted to help others and she would risk her life in doing so. In December of 1850, Tubman made the bold and dangerous decision to return south. Risking her own re-enslavement, she courageously embarked on the first of many journeys to set her people free. On her first trip she brought her niece and family to the north by the same route she escaped by. A few months later she returned for her own brother and was well on her way to earning the nickname “the Moses” of her people. In over a decade she made 19 trips to the south and back, rescuing over 300 slaves. Slave owners in the south never knew there was one person behind the escape of so many slaves, but other abolitionists did. She worked with many abolitionists like Thomas Garrett, Frederick Douglass, John Brown and William Lloyd Garrison. Douglass and Brown both counted Tubman among the bravest and most important anti-slavery heroes of the day. Tubman successfully led slaves to freedom for nearly a decade without ever being discovered or losing a single passenger on her “underground railroad.” She was a valued activist and spoke publicly to abolitionists while taking care of her relatives and fighting her illness. When the Civil War began Harriet first served as a nurse before adopting a more active role by helping map terrain for the Union Army and even leading armed assaults. When slaves were liberated from captured Confederate Territory she helped to recruit them to the Union Army. Despite her incredible work and dedication to the Union, Harriet was never compensated and the U.S. government did not properly recognize her service until nearly 40 years later. The fact that she never received compensation combined with her role as caretaker for her family and rescued slaves meant that she was in a perpetual state of poverty. Despite the constant difficulties she faced with her health, her finances and the total lack of recognition, Harriet never stopped working to help other people. Harriet Tubman showed great heroism during her journey from slavery to freedom to liberator. Her life was not easy and her experience of belittlement and hardship persisted even into the 20th century. Even though she was oppressed herself in being a disabled, uneducated, black, former slave woman, she navigated physical, social and political danger for the sake of freedom. She received some recognition for all of her many achievements, including her work in the suffragette movement. She pursued her vision unswervingly and by the end of her life, Tubman was widely known and finally received the respect she deserved. After her death she has become widely recognized as one of the most important American heroes and activists for the end of slavery and civil rights for former slaves, African-Americans, and women. Mary Hampton, Kelsey Donner, & Jessica Partlow are undergraduate students at the University of Richmond. They wrote this essay as part of their course requirement while enrolled in Dr. Scott Allison’s Social Psychology class.